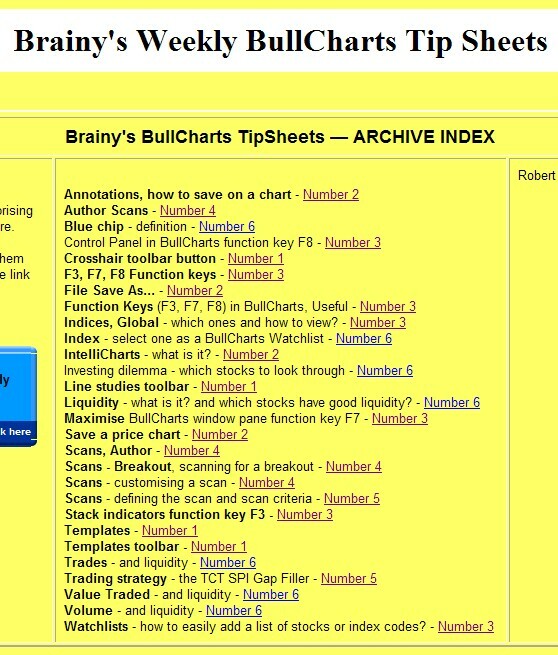 Welcome to the 7th edition of my weekly BullCharts software Tip Sheets, focussing on tips and hints relating to the use of the Australian BullCharts charting software package. I need to keep this week's Tip Sheet short, because of some tight time frames. I have only recently finished the January edition of Brainy's monthly e-Newsletter articles, so I have little time left for this week's Tip Sheet. 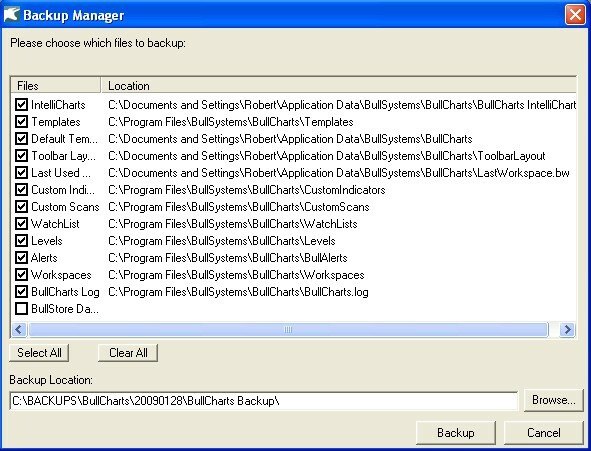 BullCharts Backup and Restore feature - why? how? where? Share Trading - exactly what is a company's share actually worth? How do you find out? Technical Analysis - Support and Resistance - including trendlines (which are actually support or resistance lines), and overhead resistance. If you are a subscriber to my monthly e-Newsletters, then you already have access to this material. You can see a preview of the articles (the first page of each of the four 4-page articles), or consider subscribing. Click here for more details about Brainy's Monthly eNewsletter articles (on Technical Analysis, Share Trading and BullCharts). There is a very useful backup and restore feature in BullCharts (since version 3.6). Why would you want to use this feature? Well there are a couple of reasons, the most obvious one of which is just in case something happens to your files, and you need to reinstate them. Which files? For a hint, see the screen shot here (click on it to see a larger view). The worst possible situation would be if your computer was stolen (or the house burns down, heaven forbid). In a situation like this, could you manage without your computer and the software? You can easily reinstall the software, but any data or files that you customised yourself would be gone. Of course, you should already have in place a Disaster Recovery Plan (DRP), or at least a Business Continuity Plan (BCP). You might think that these are only for large businesses, but they are also very useful for individual traders. More on this topic in another one of Brainy's eNewsletter articles soon. Alternatively, you might have a desktop PC in the home/office, and a laptop for use on the road. It is possible that the software license might permit you to have BullCharts installed onto both computers. If so, how can you keep the various files and data synchronised across both computers? One way is to take a backup from one computer, copy the backup files to the other and restore them. One very useful feature of BullCharts is that many "things" are stored in separate discrete files, and not all lumped up into a database, or into a master file. So the BullCharts backup feature provides lots of flexibility. In this month's e-Newsletter article (available to subscribers) we take a look at the various BullCharts files that exist, and which could be backed up for restoring later; and we look at the various backup and restore options, and how to do it. 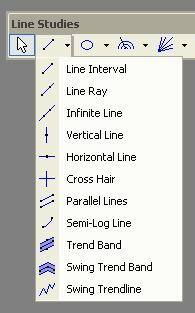 One of the BullCharts tools that many people would be familiar with is the selection of lines that are available on the Line Studies Toolbar. The first button on that toolbar has as many as 11 buttons to draw a range of different "lines" on the price chart. See the accompanying screen shot for the list. The most common of these would have to be any of the first 3, to draw a straight line on the chart - as in a trendline. Remember to draw an uptrend line under a rising price (indicating support of the price), and a downtrend line above a falling price (indicating a ceiling resistance line stopping the price from rising). Also, a trend line needs to touch at least 2 points on the price chart to indicate a valid trend. Three points is better. Some people believe that if the price touches the trend line even more than this, then it is starting to indicate possible weakening of the support/resistance line, and a potential break through it. One option on these first three lines is to "Snap to Data". More on this in another next section below. And there is more information on Support and Resistance in the Third (January) edition of Brainy's monthly e-newsletters (available to subscribers). Click here for more details. The BullCharts software includes a good Help facility. With BullCharts running, just hit the F1 function key. See the accompanying screen shot here (click on it for a larger view). 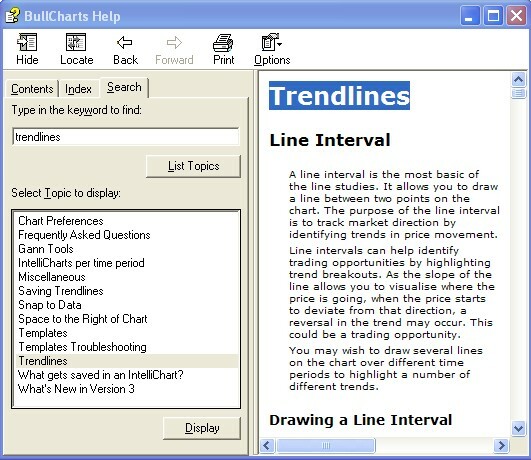 To see more information in the online Help on the various Line Studies toolbar buttons for trend lines (all those shown in the screen shot further above), click on the "Search" tab in the BullCharts Help, then in the "...keyword to find" field type in trendlines and either hit the Enter key, or click on the "List Topics" button. In the displayed list of search results (under the heading "Select Topic to Display"), scroll down the list to the "Trendlines" entry and either double-click on it, or click on it once to select it and click on the "Display" button. You can then scroll down through the displayed material for more details about these toolbar options. When you draw these lines on a price chart, there is an option to "snap to data". But there are a couple of ways you can use this feature. Firstly, draw the line on the chart. Now you can right-click on the line and click on "Snap to data" from the drop-down menu list. This will snap the two "handles" of the line to the price data (actually to the Close price). You can then adjust the location of the line by clicking on one of the handles on the line and dragging it sideways. But while the "Snap to data" option is on, the handle will always lock onto a Close price. Or, you can right-click on the line and select "Properties" from the drop-down menu list. In the "Properties" dialogue box, click on the "Parameters" tab, and notice the check box to the right - "Snap to data" - which has a link under it that says "Learn more". If you click on this link you will see the dialogue that is displayed in the accompanying screen shot to this article above (and you can click on it to view a larger image). Draw the line on the price chart in the normal way, in roughly the right location. Use the mouse left-click to grab one of the line's handles. Drag this handle across the chart until it is on the desired candle. Keep holding the left mouse button down. Now just tap a key on the keyboard - the letter O for Open, H for High, etc. (note that "tap" the keyboard means to hit the letter on the keyboard and release - a quick tap). Now that I have a few Tip Sheets produced, and available from my online Tip Sheet archive, it will be useful to have an index so that we can all find relevant information quickly and easily. So I have now put up a web page that contains just an index of the Tip Sheet topics. A quick cropped screen shot of the page is shown above, and you can click on the link to go to that page. I will update the page each week to include new material as it is produced.